All of us at the Welbodi Partnership would like to wish you and your family good health and happiness during this festive season, and to thank you for helping us share this good fortune with the children we serve. 2012 is coming to a close and we would also like to close the gap and raise the remaining funds we need to fully fund our project to establish a functioning x-ray department at the Ola During Children’s Hospital (ODCH). As you may recall, very sick children must now travel miles across Freetown – through traffic and crowds and the overwhelming hustle-and-bustle of this busy urban area – just to get an x-ray to diagnose their condition. This taxing journey is an unacceptable burden for tiny bodies already weakened by illness, and it causes dangerous delays in diagnosis and treatment. The very sickest children often cannot make the trip at all. 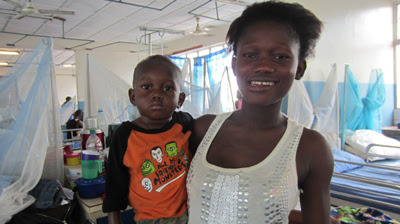 With your help, we can ensure that by this time next year, patients at ODCH and the neighboring maternity hospital will have access to life-saving on-site x-ray facilities. Dr. Anne Nesbitt, a Welbodi volunteer supported by the Royal College of Paediatrics and Child Health, recently made the trip to get an x-ray with young Alhaji and his mother (seen in picture above). The trek across town left Alhaji feeling even more unwell than he was before, and it took him several days to recover. We would like to share their story in order to show the importance of this project and how with your help, we can make a difference. "18-month-old Alhaji has septic arthritis of his shoulder. We had no option but to walk with Alhaji being carried on the back of his mum to Connaught Hospital, several obstacle-strewn miles across Freetown. Within 50 yards of ODCH, my phone was stolen. Half-way along Fourah Bay Road, Alhaji's mum's flip flops broke, so we had to buy new ones before we could continue. We negotiated the mayhem of Sani Abacha Street and finally got a taxi the last half mile to Connaught. On the way back, no taxi would agree to take us to the East End, so we trekked back through short cuts. At one point, traffic was heavy on Sani Abacha, and our leap to avoid a lorry resulted in the demolition of a stack of margarine cartons and a stiff lecture (to me) from the market ladies. The journey back took an hour." On a regular basis, families with children much sicker than Alhaji make this journey for x-rays, delaying diagnosis and putting their health and safety at risk. This is clearly untenable, and the sooner we can establish an in-house ODCH x-ray service, the better. Can you give a little toward this effort?